Charli Darragh at the grave site of her mother, Marie Darragh. 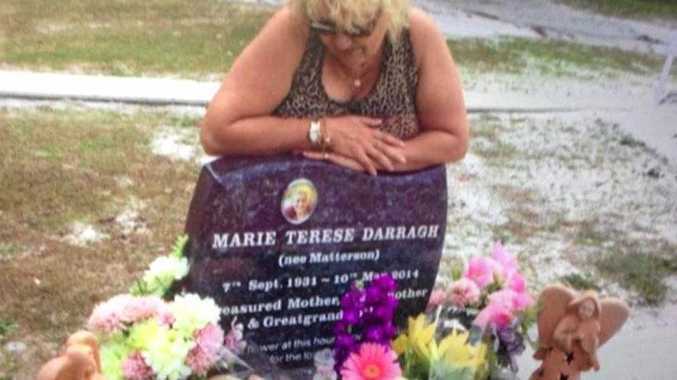 THE family of murdered Ballina nursing home resident Marie Darragh plans to sue St Andrews Village, alleging it breached its duty of care. Former registered nurse Megan Jean Haines has been found guilty of injecting fatal insulin doses to Ms Darragh, 82, and fellow resident Isabella Spencer, 77, after they filed complaints about her in May 2014. Haines was already on probation with reporting requirements to the Australian Health Practitioner Regulation Agency after receiving a slew of complaints from previous jobs. She lost her nurse registration in 2008 after twice administering insulin injections to non-diabetic patients at a medical centre in Victoria. This was the same modus operandi she used to kill two women six years later. Ms Darragh's daughter, Charli Darragh, said she and family members had been planning to sue St Andrews for months. "We have been in the process for six months, waiting for the verdict to come in," she said. "Now our solicitors can start immediately pushing the papers." Charli said she was shocked the centre had given Haines copies of Ms Darragh's complaint identifying her by name. "That alone is a privacy issue," she said. "Other than suing the nursing home for the medical things that have happened to us, we are also suing for a lack of duty of care." Charli said nine nurses had contacted her saying they had applied for Haines' job but they were shut down. "They could not believe that given their credentials and the fact they lived locally, they would choose her over them," she said. "If they had looked at her back records there is no way they would have hired her because of all the complaints." St Andrews chief executive officer Pip Carter did not wish to comment when contacted by The Northern Star yesterday.